Mama Simona is a Hostels chain that receives travellers from all over the world since 2010 in Cusco City, Ollantaytambo (Sacred Valley) and Aguas Calientes (Machupicchu town). Our quality and service is what sets us apart from the rest. We offer a warm and quiet atmosphere where you can rest and get ready for your next adventure. Make sure to have a lock for your belongings. It's quite colder inside the hostel than outdoors. Very helpful staff. Nice atmosphere and good quiet location near Plaza del Armas. Had a wonderful time and the staff was very helpful!! Everything was great here other than the lack of outlets and Wifi access in the rooms themselves. The staff at the front desk is to be commended for doing a superb job. On the second day that I arrived I was feeling sick. I spoke to the front desk and they called for a cab to send me to the local medical clinic. Turns out it was altitude sickness and salmonella! The clinic was staffed by excellent doctors and I was feeling great and discharged after a day. Another Mama Simona front desk staff helped carry my elderly aunt and uncle's luggage up 2 flights. The best hostel staff I've ever met! Lovely hostel with some great staff (esp. Indira). Unfortunately the wifi is so bad that it's like if there was none. We asked to have the router rebooted, but that didn't help. We weren't able to do any research on our travelling because of that, so in the end moved elsewhere. Clean and comfortable room. Noise can be a problem. Coca tea in the lobby is lovely. Breakfast was barebones but fine. Pretty good location overall. A bit of confusion when booking tours from here but they let you store luggage while you're away on treks. The hot showers are a godsend and have high pressure without running out. 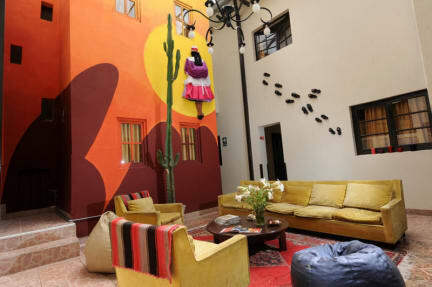 The Hostal is comfortable but not the place to stay if you want any kind of socialising. WiFi is none existent even in the lobby area it hardly ever works. Even though it’s a quiet hostel you can hear everything from other rooms so we got woken up every morning by other guests and staff. It’s not an awful place to stay but it’s definitely my least favourite in a years worth of travelling.